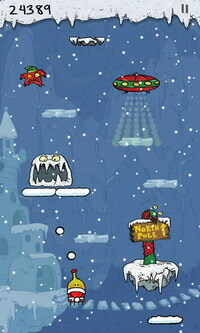 Doodle Jump, the iconic endless jumper game is getting an exclusive holiday makeover. 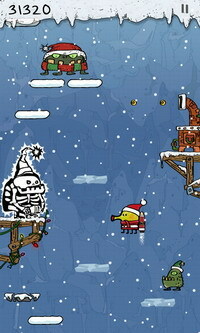 Developers Lima Sky have created a new standalone version of the game called Doodle Jump Christmas Special which brings new Christmas art, monsters, paths and challenges to this release. Although the original game does have a Christmas update, the work done on this new release is more expansive in terms of the graphics. The monsters are decked up for the holidays too, and the extensive Christmas trees, presents, snow, and holiday inspired background work certainly puts you in the spirit of the season. Although the game appears to have got its own unique app, there doesn’t appear to be anything refreshingly new that would add more layers to the game. 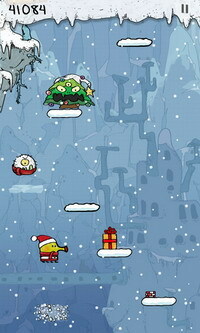 If you love Doodle Jump and don’t mind downloading another free app just to play the holiday themed game, you can do so by clicking the link below.